I know! That may seem harsh but the fact is if your dog is overweight then he’s either ill or he’s going to be ill.
Just like weight gain is a sensitive subject for us, it’s also a sensitive subject for most dog owners. In fact, I know one vet who has lost several patients after suggesting their dog needed to lose a few kilos! There is no quick fix − if your dog is overweight you need to take action now. 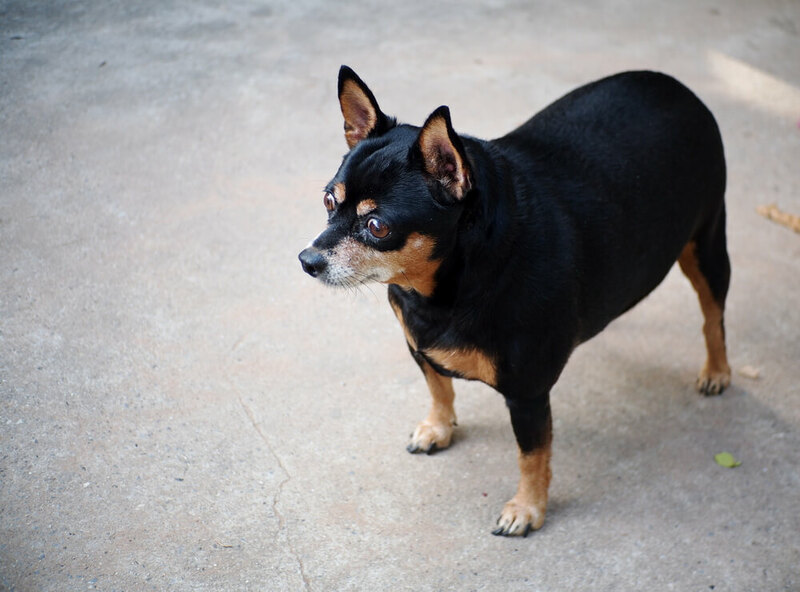 Excess weight has serious consequences for your dog’s health and quality of life. Initially, visit your vet to rule out any medical reasons for your dog’s weight gain and to make sure your dog is healthy enough to start on a diet and exercise program. Be honest about what you feed your dog – including table scraps and the ‘occasional’ ice cream! If your dog is only slightly overweight, it may be enough to cut out high calorie snacks while increasing physical activity and possibly feeding a little less at mealtimes. However, dog food manufacturers only guarantee to meet your dog’s nutritional needs if you feed the recommended amount – reducing that amount may have a knock on nutritional impact. To avoid this possible problem, if your dog needs to lose 10 percent of his body weight or more, switch to a food designed for weight loss. A weight loss of 1-2 percent per week is recommended. Any more than that will result in loss of lean body tissue, increased health risks, excessive hunger and related behaviour problems. A basic formula for calculating how much to feed your dog is his resting energy requirements (RER). RER is the number of calories that your dog burns in a day without any activity. To calculate RER, you multiply your dog’s ideal weight by 30 and then add 70. So for example, say your dog weighs 25kg. Ideal body weight is 20kg. Feed at least two meals a day. More frequent, smaller meals do a better job of keeping hunger at bay and your dog’s metabolism elevated. Most weight loss dog foods on the market are high in fibre and carbohydrates. They typically provide 45-55 percent carbohydrate, 18-28 percent protein, and less than 10 percent fat. Low fat foods can result in dry skin and poor coat condition as well as difficulty absorbing fat-soluble vitamins. They also tend to reduce palatability, especially when combined with high levels of fibre. Dogs often refuse weight loss products or eat them with such lack of enjoyment that you are likely to feel so guilty that you end up feeding the regular diet or adding ‘extras’ which then defeat the whole point of the diet change! A meat based high-protein low-carbohydrate diet has been shown to make dogs feel full on less food and is much more palatable to dogs, particularly when combined with a moderate amount of fat. Your dog is also much more likely to lose fat and not muscle mass on this type of diet compared with the high fibre alternative. Needless to say, losing muscle tissue can cause other severe health problems and lower metabolic rate. Start out slowly – five to ten minutes is good for a sedentary dog. Build up slowly. If you have a small, but chubby pooch he can even get enough exercise chasing a ball or toy around the house. As he becomes used to increased activity include a brisk walk. Larger breeds can benefit from jogging, longer walks and off-lead exercise. Try throwing a ball – most dogs love it and they don’t even know they are exercising! If your dog is really overweight, consider swimming as this will take the pressure of his joints as he loses the weight.